The Ornette Coleman Biography show that a when a dude does something "radical" in a music that is already deemed "radical"... he may be hated for no other reason than being "different"! 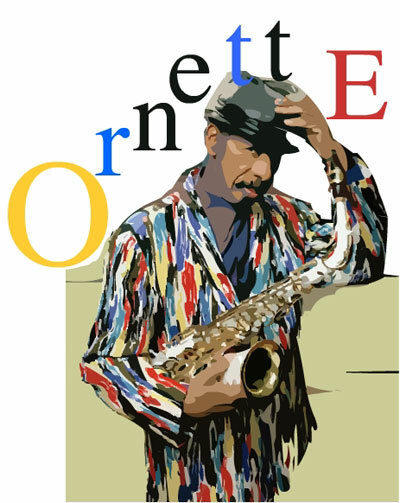 Ornette Coleman Biography begins with him born March 19, 1930, in Fort Worth, Texas, Ornette Coleman enjoys the reputation of being a genuine revolutionary in modern jazz, but one who is still less than fully embraced by the listening and critical establishment. From the start, his singular playing style (rooted in his idea of free jazz--"everybody is soloing, harmolodically") outraged some critics and fellow musicians and bewildered many jazz lovers; but it also inspired high praise from players and writers alike. When the cat plays you know you are hearing a unique voice... isn't that what jazz started as? In 1990, at age 60, he has composed over a hundred songs, a symphony, a string quartet, and a woodwind quintet, and he has released more than thirty long-playing records. But in this same life's span he has suffered material deprivation, commercial exploitation, racial brutality, and professional humiliation, all on a scale which rather befits a false prophet than an acknowledged musical genius. And the dude still sticks to his guns! New Yorker jazz writer Whitney Balliett referred to this uneven motion of life and career when he said: "Few twentieth-century innovators have got in their own way as often as Ornette Coleman.... He is a stubborn and brilliant visionary and a man of great integrity, and these attributes have hobbled him." Born in 1930 of a poor black family in Fort Worth, Texas, Ornette taught himself alto saxophone by age 14, and before graduating from high school the dude was supporting his widowed mother and a sister by playing tenor saxophone in local rhythm and blues bands. I think that's a great "radical" move in itself! He learned to play marches and hymns in school and church bands, but at the same time he was listening to honky-tonk, blues, and funk. After he heard Lester Young in a Fort Worth jam session playing show tunes "with bridges," he set about memorizing popular songs off the radio, buying sheet music, and teaching new songs to his own band. The jazz cat quickly figured out commercial tricks like distinguishing among white, black, country, and Mexican repertoires, and liked mimicking the rhythm and blues tenor dudes leaping, bending, and honking moves. This aptitude enabled the young Coleman in the year 1947 to earn a hefty hundred dollars a week as a gigging musician. That's was alot of bread back then! His jazz styling was already being influenced by a combination of Charlie Parker, Jimmy Dorsey, and Pete Johnson. At 18, instead of accepting any of the music scholarships offered by several black colleges, he joined a touring minstrel show, which soon left him stranded in Natchez, Mississippi. He found his way to New Orleans and then Baton Rouge, where he was beaten up one night after a dance gig by "guys who didn't like my clothes or my hair." Taking a look at his locks, beard, and eloquently careless garb, the police warned him to get out of town before they finished him off themselves. The cat had dredlocks before they were even "hip"! Returning home, he started playing alto again, using a horn borrowed from a New Orleans friend. By late 1949, at age 19, these experiences had solidified both his character and his playing style. Both would bring him distinction and trouble. He spent most of the 1950s in Los Angeles, initially with the rhythm and blues band of Pee Wee Crayton. "His style, already formed," Balliett explained, "alienated club owners and other musicians, and he found little work." Indeed, he was ignored, scorned, and even shunned at jam sessions by the likes of Dexter Gordon, Clifford Brown, Sonny Rollins, and Max Roach. What a damn shame that an original cat was turned away in an "original" art form! But thank god the dude stayed true to is "muse"! However, he found compatible spirits in trumpeter Don Cherry, bassist Charlie Haden, and drummer Billy Higgins, with whom he formed an early quartet for gigs around Los Angeles and, eventually, Chicago and New York. Contemporary Records produced his first two LPs in 1958 ( Something Else and Tomorrow is the Question ), and a year later Atlantic jumped on the fashionable "free jazz" wave, issuing seven disks of Coleman's groups between 1959 and 1962. This rush followed the celebrated debut of the original quartet at New York's Five Spot in 1959, with Haden and Higgins making innovative harmony and rhythm, Cherry blowing a provocative "pocket trumpet," and Ornette sailing over everyone on his soon-to-be-notorious white plastic alto saxophone. He was so cool that the white plastic alto saxophone made a unique statement! His flash flood of post-be-bop popularity carried an unhealthy amount of controversy. There were sometimes fights in the Five Spot during the quartet's five-month appearance there. The New York music avant-garde quickly lined up pro and con Ornette Coleman, with Leonard Bernstein, Gunther Schuller, and the Modern Jazz quartet's pianist John Lewis asserting Coleman's brilliance against dismissals by prominent performers like bassist Charlie Mingus and trumpeters Kenny Dorham and Miles Davis. (In a 1986 People article, David Grogan reports that it was Davis who pronounced the adventuresome altoist "all screwed up inside.") Coleman soon developed an antagonism towards the recording companies, who he knew were exploiting him. Coleman began demanding extraordinary fees for recording and live appearances, justifying it by pointing to the discrepancy between the sums of money he attracted and the amount he took home. The cat new he was treated lilke the "circus comes to town", so he wanted "circus" kind of dough! His free-style playing and conception, along with his theoretical comments about "harmolodics," only amplified the argument about his talent and genuineness. (The titles no less than the substance of the early Atlantic albums-- The Shape of Jazz to Come, Change of the Century, Free Jazz --set the tone and drew the boundaries for this dispute.) He grew an initial reputation for deliberate obscurity, fakery, and self-indulgence. All this was happening in the heated-up climate of mid-1960s America, with the explosions of pop-rock, pop-psychology, the sexual revolution, and Vietnam protests just around the corner. Like many of his black jazz cat contemporaries of an earlier generation, Ornette Coleman withdrew from this emotionally taxing scene and did not re-emerge often until the early 1980s. The cat knew he had to et away from America and the "mainstream" jazz and delve deeper into his mind! So he got "lost" and discovered he was all he needed to keep going! In the meantime he learned to play trumpet and violin, toured Europe and North Africa with several groups, and began composing in different idioms and for alternative instrumental combos. His 1972 symphony, Skies of America, is written for jazz quartet and full orchestra. The 1977 Dancing in Your Head contains a live "jam" between Ornette and Moroccan tribal musicians, along with compositions of his own that were inspired by this mid-1970s visit; it is performed by a new electronic rock-funk-blues band, Prime Time, which features two electric guitars, one or two bassists, and two drummers. This fusion group has been his combo of choice for most of the 1980s, featuring himself on alto, soaring freely above the high-energy polytonality and polyrhythmics of drummers Ronald Shannon Jackson and Denardo Coleman (Ornette's son), bassist Jamaladeen Tacuma, and guitarists James Blood Ulmer, Bern Nix, or Charles Ellerbee. Veteran Coleman fans and musicians whom he has influenced agree that the combination of his theoretical pronouncements and his steadfast commitment to his own vision has complicated the public's appreciation of his music. Among the younger musicians who owe a large debt to Coleman's ground-breaking artistry, saxophonists Branford Marsalis and Dewey Redman, popular jazz guitarist Pat Metheny, and Grateful Dead guitarist Jerry Garcia tell the same story: Ornette begins sessions by explaining his musical conception in very dense, puzzling terms, but when it comes time to perform he says "Just go ahead and play, man." His oldest sideman, Charlie Haden, had already been similarly drawn to this free-jazz experience in the late 1950s, when, as he relates in the People, Ornette told him: "Here are some chord changes, but you don't have to play them. Just play what you hear." Haden's response was like that of many a modern jazz player since: "Man, I had so much fun I couldn't believe it. It was spontaneity like I had never experienced before. Each note was a universe. Each note was your life." This is a good characterization of free jazz. Coleman himself described it this way to Balliett: "'Improvising' is an outdated word. I try and play a musical idea that is not being influenced by any previous thing I have played before. You don't have to learn to spell to talk. The theme you play at the start of a number is the territory, and what comes after, which may have very little to do with it, is the adventure." Most fans agree that Charlie Parker is his biggest alto influence--the similarly voice-like tone, the bursts of lyrical runs, the rhythmic irregularity--but Coleman's melodic conceptions are much freer than Parker's. Detroit-area bassist Ted Harley, who has been an Ornette devotee since first hearing the quartet in 1958 at Chicago's southside Sutherland Hotel, declared: "His playing is almost purely melodic, but the key to his group sound is the bass player: his melodic invention varies according to who's on bass. Listen to him with Charlie Haden, then with Jimmy Garrison, then Scott La Faro. Ornette and the bass, that's it." "Harmolodics" is the name Coleman concocted (from "harmony," "movement," and "melodic") in an early attempt to explain what he was doing, possibly in answer to the furiously negative responses his playing received. This is Branford Marsalis's opinion (as quoted by David Fricke in his 1989 Rolling Stone article): "Coleman was dismissed as a heretic simply because he couldn't explain what he was doing." For all the bewilderment, however, Coleman's theorizing makes perfect post-modern sense. "In America you can know exactly who you would like to pattern yourself after and what you'd like to do," Balliet quoted him as telling Leonard Feather, "but the moment you find something you can do that outdates that ... it's no longer the same idea anymore, it's a different thing ... [this] problem ... could be even more healthy if a solution could be made where every person could express his consciousness to its fullest without outdating the particular information he's gotten to do that or to enhance it. The world would be ten times more productive." "What I'm saying," he continued in Rolling Stone, "if you take an instrument right at this very moment and play it, it's not impossible that you will play something that no one has ever heard before.... The melody can be a rhythm note. It can be a key note. The time can be the melody. It's like the difference between spelling cat with a k or a c. It still sounds the same. To me, that is the tool in harmolodics, how to convert sound into your own language." His longtime friend John Snyder told Balliett: "It's his theory of music, and it has nothing to do with what they teach you in music school. It's the sound in the instrument. It's the structure he's built around his feelings." Ornette Coleman's musical life has received a rejuvenating jolt from the surge of youthful interest in jazz after be-bop, the birth of rock-jazz fusion, and the spreading movie and news treatment of American jazz careers. Add to this his new business relationship with the Fort Worth recording company, Caravan of Dreams, the recent albums with Prime Time and Pat Metheny. For listeners to the post-modern jazz of this embattled innovator, these words to down beat interviewer Howard Mandel should be instructive: "Here I am with a band based upon everyone creating an instant melody, composition, from what people used to call improvising, and no one has been able to figure out that that's what's going on. All my disappointment about it just makes me realize how advanced the music really is." A jazz cat is someone that follows wherever the music takes them... Ornette Coleman is a JAZZ CAT.. you dig? Back to Ornette Coleman Biography and other Jazz Cats!